[English translation] Book review: El mito de la educación (The nurture assumption), reviewed by Roberto Colom, Psichothema, January 2000. Copyright 2000 by Psicothema. May not be republished without permission. 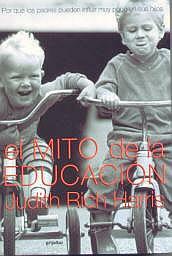 "El mito de la educación"
Recently published in Spanish is an enjoyable yet rigorous book by an author whose professional life was devoted to writing textbooks for psychology students. The translation presents some problems, but they are not particularly important. For example, it confuses "gemelos" (identical twins) with "mellizos" (fraternal twins), but the description of both categories is correct, which is why it is easy to recognize the ambiguity. Also the title of the book is inadequate. Literally the original title would be "El supuesto de la crianza" in Spanish ["The Nurture Assumption"], much more fitting to the content than the one chosen by the Spanish publisher ["The Education Myth"]. The origin of "El mito de la educacion" is an article published in "Psychological Review" in 1995, which received the George A. Miller prize awarded by the American Psychological Association to works of noteworthy importance (Harris, 1995). The renowned psycholinguist Steven Pinker is the author of the Foreword to Harris's book. Pinker writes: "I predict that [The Nurture Assumption] will come to be seen as a turning point in the history of psychology." The book has two general objectives: to call into question the idea that the personality of the offspring is formed or modified by its parents, and to offer an alternative perspective on the process through which the personality is formed. The author carefully collects and analyzes diverse findings in the social sciences. One of her first tasks is to demonstrate that children behave in one way within their homes (with their parents) and in another outside (away from their parents); that is, they use two codes of conduct suited to the context. The widespread idea that the parents can have a long-term influence on the personality of their children comes, according to Harris, from academic psychology, but it is akin to longstanding folk psychology. Nevertheless, the academic notion -- promulgated by socialization researchers -- has ended up influencing the popular conception, even though it rests upon a crucial error. The socialization researchers have forgotten to separate two sources of influence: the genes and the family environment. Thus, for example, if we analyzed a sample of parents and their biologically related children, and observed that there are some similarities between them, we might draw the (mistaken) conclusion that such similarities must be due to the former having created them in the latter. Nothing is farther from the truth: those similarities must be due largely to the genes that the children share with their parents, as has been demonstrated by the studies on adoption carried out by the behavior geneticists: "The failure to control for the effects of heredity makes the results of most socialization studies uninterpretable" (p. 47). A little farther on, Harris states something especially important for her thesis: "Children come into this world already different from each other. Their parents treat them differently because of their different characteristics" (p. 51). Nevertheless, Harris, like the behavior geneticists, is very careful to make clear that, regarding the development of personality, everything does not depend on genetics. The formation of the child's personality is influenced by the environment at least as much as by the genes. But, which environment? According to her, the parents are not that environment. The environment that is relevant is composed, in essence, of the peer group. In fact, the theory that Harris proposes is called "Theory of Group Socialization": "Children are born with certain characteristics. Their genes predispose them to develop a certain kind of personality. But the environment can change them. Not 'nurture' -- not the environment their parents provide -- but the outside-the-home environment, the environment they share with their peers." (p. 192) In other words, socialization is not something that adults do to children, but something that the children do on their own. To support this idea, Harris relies on investigations done with animals, on the accumulated knowledge about humankind's past, on the results obtained by the behavior geneticists, and on a series of experiments on groups carried out by social psychologist in the '50s. In the course of sifting through diverse relevant investigations to back up her theory, Harris has messages for those in charge of social action programs aimed at the adolescent population. For example, she offers her opinion of campaigns designed to discourage smoking. According to her, telling adolescents about the dangers of tobacco is not sensible, since it is propaganda designed by grownups. Because adults do not approve of smoking, adolescents feel more inclined to do it. There is resistance between adolescents and adults, basically because adolescents need to differentiate themselves -- Harris calls this "group contrast". The messages about behavior sent by adults make no sense to adolescents, because they create their own world and live in it. Perhaps one of the strongest arguments in Harris's book is in regard to the possible consequences of the reiterated messages by some "experts" in educational psychology. According to her, those experts' books ignore the fact that all children are born different, as mentioned above. Having convinced parents that what they do at home will have a lasting effect on their child's personality, the experts have generated intense feelings of guilt and, of course, they have destroyed the spontaneity in human relations in the home. On the contrary, scientific investigation has demonstrated that parents do not have a long term effect on the personality of their children. In fact, in the long run, and within a more or less normal range, it doesn't matter who the parents are -- though this is not to deny that there are exceptional cases in which some parents may have a long-term influence on the personality of some children, or that parents can act negligently. What will weigh heavily are the genes that the parents happen to give to their offspring and the experiences that these children have outside the home, within their peer group: "Heredity is one of the reasons that parents with problems often have children with problems. It is a simple, obvious, undeniable fact; and yet it is the most ignored fact in all of psychology. Judging from the lack of attention paid to heredity by developmental and clinical psychologists, you would think we were still in the days when John Watson was promising to turn a dozen babies into doctors, lawyers, beggarmen, and thieves." (p. 370). As she develops her theory, the author provides very interesting pointers on how to analyze the effect of the environment on the personality of children. Thus, for example, studies of immigrant families, in which the parents belong to one culture and the rest of the community belongs to another. This allows one to distinguish the effect of parents from the effect of influences external to the family. Also there are studies of families in which the parents are deaf, but not their children. In these cases, it has been shown that the children acquire the culture which they observe and experiment with outside the home, not within it: "The world that children share with their peers is what shapes their behavior and modifies the characteristics they were born with, and hence determines the sort of people they will be when they grow up." (p. 253). This fact calls into question, moreover, the tired old story of the repercussions of divorce on the later development of children. According to the studies reviewed by Harris, it is not certain that divorces have long-term impacts on the personality of children. The author also questions the widespread stereotype that children must be raised by a father and a mother; this has not been demonstrated scientifically. Hence, a child could be reared quite well by a homosexual couple, since in fact the child is socialized within the peer group, not within the home. Harris reviews the implications of her theory for such social phenomena as scholastic failure. According to her, children who hang out with good students tend to show a favorable attitude towards schoolwork, and conversely. In fact, the author believes she has found the main cause of the well-documented, but still unexplained, average difference between the two main American ethnic-racial groups on standardized tests of intelligence: "Black kids and white kids identify with different groups that have different norms. The differences are exaggerated by group contrast effects and have consequences that compound themselves over the years.... Black kids who do well academically are pressured by their peers not to work so hard. They are failing to conform to the norms of their group: they are 'acting white.'" (p. 316). On this track, Harris also suggests why programs to raise intelligence have not worked as they were expected to. It is is because the programs have been centered on something that is not important: trying to change the behavior of parents with their children. On the contrary, such programs would have to modify the behavior and attitudes of a group of children: "programs aimed at an entire schoolful of children should be more successful than those that pluck seventeen children from ten or twelve different schools." (p. 320). In sum, Harris's book is courageous and suggestive, but also rigorous. In fact, some empirical research designed to test the author's theory has already been published, with positive results (Loehlin, 1997). Although the basic foundations of the "Theory of Group Socialization" have been known for a long time, Harris has carried out brilliantly an essential feat of integration. In addition, she has made accessible to the general public, using comprehensible language, scientific knowledge that is difficult to convey. 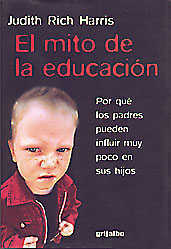 Nevertheless, "El mito de la educacion" is not likely to have an impact like "Emotional Intelligence" by Daniel Goleman, in spite of being an equally entertaining book, much better supported by scientific evidence. That is because people probably do want to hear that intelligence is not important, that it's the emotions that count, but they are not likely to want to hear that what they do to their children will not have effects in the long run. Yet society cannot ignore the scientific evidence when it is so overwhelming. Sooner or later, Harris's work will be reflected in the society to which it is directed. Harris, J.R. (1995): Where is the child's environment? A group socialization theory of development. Psychological Review, 102, 3, 458-489. Loehlin, J. (1997): A test of J.R. Harris's theory of peer influences on personality. Journal of Personality and Social Psychology, 72, 5, 1197-1201.